Earlier today, Spotify removed listening caps from its web-based music service. 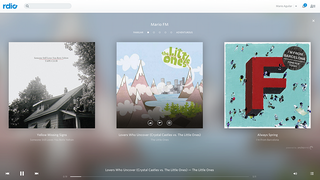 And so the struggling Rdio streaming music service has decided to follow with its own announcement: Free on-demand music forever on the web—as long as you're willing to listen to some of the company's newly conceived advertising. Yup, everybody's shaking in their boots over the launch of Beats Music next week.